Our newly crowned Ms. Virginia, Janis Thomas, was raised in the historic town of Harpers Ferry, West Virginia, where she attended a small four room elementary school. She attended Shepard College attaining a degree in Language Arts and Library Science, and earned a Master’s Degree in Counseling from West Virginia University. She moved to Virginia in 2000 to be closer to her job as an elementary school counselor. A lifelong dancer, her first formal dance class was at the age of 23, and she hasn't stopped dancing since. An educator for over 36 years, she prides herself in helping students learn academically, socially, and emotionally. Janis is the creator of a board game named the New Student Game published and distributed by Marco Products. She recently launched a consulting business, ‘The Counseling Curricular’ and she also owns a franchise with a telecommunications firm that markets services via the internet. The franchise donates a share of its earnings to the ‘Feeding America’ charity directed toward ‘Project Feeding Kids’ which help provide meals for needy children across the country. She loves cooking 30 minute meals, exercising, reading, Jazzercise, walking, scrapbooking, card making, and playing with her adorable grandchildren. After falling in love with the guitar, she is teaching herself how to play. Janis is proud of the two successful children she has helped to raise and continues with the mentorship of her two amazing grandchildren. Family is of the utmost importance to her, and she enjoys every minute spent with them. 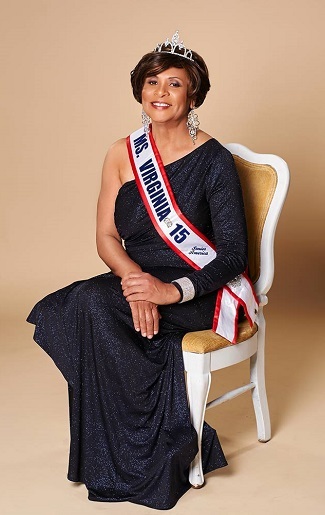 Her future goals are to continue to learn new things, build her business, continue dancing, have worldly experiences, enjoy being Ms. Virginia Senior America, and share in other people's happiness. She firmly believes when you help others your own world becomes brighter and more productive. Her motto—each day brings another opportunity to be great.